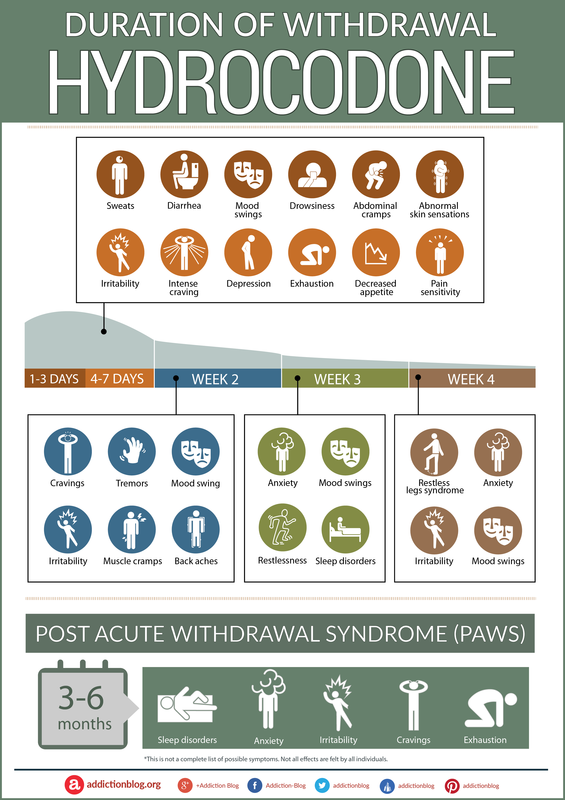 A visual guide to symptoms of hydrocodone withdrawal and the TIME OF THEIR APPEARANCE. What happens in the days and weeks after you quit? Find out here. Hydrocodone is a semi-synthetic narcotic analgesic, prescribed for severe pain. Regular dosing of hydrocodone for a period of a few weeks or more can lead you to physical dependence, as well as addiction. So, when you lower the daily dose or stop taking hydrocodone abruptly, you may experience hydrocodone withdrawal symptoms. Explore our visual guide below for the timetable of when you can expect symptoms of hydrocodone withdrawal to manifest. And, if you like it, feel free to print it our for an office wall or in your clinic. We hope that our readers use these resources in real life! Or, if you’d like to share the infographic on your blog, the embed code is right below the infographic. When you become physically dependent on hydrocodone, the nervous system has adapted to the medication. It has to in order to function. So, over time, the presence of hydrocodone becomes normalized within the chemistry of the body. this means that when you stop taking hydrocodone or suddenly lower dosing…BANG! Withdrawal happens. It takes time for the body to reach balance again. What’s actually happening during withdrawal is that you are manifesting the symptoms that are usually masked by the depressant effects of the drug. The body needs to “speed up” to counter balance the depressant “slow down” signals caused by hydrocodone. Usually, the onset of hydrocodone withdrawal symptoms occurs within few hours after the drug effects wear off. Symptoms tend to reach their peak around 72 hours after last dose. However, the entire period of withdrawal can last anywhere between few day to several months. How long does hydrocodone withdrawal last? The period of hydrocodone withdrawal may last from a week up to few months. It all depends on a person’s individual factors: general health, frequency of use, and dosage all influence how long it takes for withdrawal to end. Generally, the longer you’ve been taking hydrocodone or the higher the doses, the longer the period of time for detox. Once you have battled the physical symptoms of hydrocodone withdrawal, you may have to deal with psychological symptoms such as cravings, anxiety, and/or depression. This is why the safest way to quit hydrocodone is to enroll into rehab program that includes a supervised medical detox. A professional detox clinic can support you during withdrawal. Medications can help alleviate or minimize discomfort. Staff can also provide emotional or psychological support as you withdraw. If you or a loved one is facing hydrocodone withdrawal, GET HELP. Call us at 1-877-736-9802 TODAY. We can help you get in touch with someone who can help. You can turn your life around and start over. Got questions? Please, feel free to post them in the comments section below. We try to respond to all legitimate inquiries ASAP.